Proud to check yet another state off my list! Had an awesome opportunity to head out to Seattle for 5 nights. The work of course was tough, bad hours as well. But lots of down time and I knew in advance I'd be doing everything I could to take advantage. I was there from Thursday-Tuesday and the only time the customer allowed us to work was between 5-7am on weekdays and 5-9am on weekends. So we would get to the plant at 4am everyday as they have some intense security and we needed to get things staged as best we could before 5am. So all of this meant that I was waking up everyday at 3:10am! Everyday I would wake up at about 2:55am to piss, then I'd lay there and say a silent prayer. I'd end up killing my alarm before it would even go off, then I'd get up at slap the button on my tiny in-room coffee maker which I'd set up the night before. I'd brush my teeth and get dressed and get all my PPE on. Then I'd dig in to my excellent breakfast - first a package of Pop Tarts, then I'd eat a package of Belvita 'breakfast biscuits' while I chugged my coffee. I'd chug some water and leave my room at 3:30am on the dot. A couple of the guys would usually already be down there in the lobby and we would leave the hotel in our giant rented SUV at 4am at the latest. So on Thursday I flew in and we went to visit the plant and take a look at things that afternoon. But we didn't have security clearance yet so we left and went back to the hotel. Before dinner, I quickly got myself together and did an almost 4 mile round trip walk to check out Goodwill Tukwila - same down my hotel was in. Found a couple gems but nothing worth buying. I already have the Bob James collab (as well as the first) and I've had the entire CW McCall discography since before I even considered myself a 'record collector'. The barbershop record is a serious score but I don't collect chorus albums. It was still a bit tempting. That night we went out to a nice dinner and I couldn't wait to get into bed and try to get as much sleep as I could. Next morning I got up for work and did what I had to do; we grabbed some breakfast at Denny's afterwards and the second I got back to my room I charged my phone and jumped on a bus downtown to check out Pike Place Market. I had a few things I wanted to see, not the least of which was Holy Cow Records. I never know what the hell to do in record stores. I've complained about this before many times. I never know what I want, I just want to dig in the crates, otherwise it's like going to the grocery store. You walk in, grab what you came for, pay and go home. No fun at all. I actually had the 4th record above when I was about 10 years old, my uncle got it for me. And I had the 3rd album above in my hands last summer but left it behind. I wonder how much they were charging for it here. My girlfriend's brother in law actually scooped it when I tossed it back and even asked to make sure I didn't want it. I didn't. Still don't. I did see a bunch of cool JJ and Kai Winding records (one is in the window below). Only other thing worthy of note was a small box of 7" jazz EPs, I saw a few more stuff from Jay and Kai but I don't remember exactly which ones. I screwed around downtown for a while and the next day again, went to work and again got right back on bus # 150 the second I could. This time I wanted to check out what looked like the biggest independent thrift store in town and my hunch was correct, and then some! Lifelong Thrift store did not mess around with their vinyl, they had more vinyl than the record store from the day previous and (gasp!) they were actually alphabetized! So I rode the bus only to Chinatown instead of Pike Place and grabbed a bike share cycle for $8 and headed up the extremely steep hills north to Capitol Hill and just about had a heart attack in the process. (afterwards I headed back south on Broadway, then southwest back to Pike Place again for foods and my daily requirement of double espressos). ...and here are racks #3 and 4! And this is a thrift store! It was honestly a bit overwhelming to look through but I did my best. I have been cycling for years but those hills were so bad I was still recovering, I was really hungry and I was also cold because I didn't have a jacket or even a long sleeve shirt. I looked through the immaculately organized and sleeved 7"s and only found one of note. Or is it? My memory fails me and I did not take a picture. It was a Neil Sedaka record on 'The Rocket Record Company' which was Elton John's label in the 70s when he brought Neil back from Europe, when his fame had waned domestically and got him to crank out some new hit records (I have all three of them). A while back I got my girlfriend one I am very jealous of, it is actually the B-side that I love. I do have his biggest 'come-back' which is the torch version of one of his biggest hits, I never get sick of either version. I feel like perhaps I saw a single that had both versions...but I thought I had it so I left it behind. But now I cannot find evidence of such a thing? I need to research this further. So I left and went across the street into a second hand clothes store hoping to find a thin jacket or a sweater or something but it was all overpriced. So I ended up going back into Lifelong and I did find a new long sleeve polo for $6 that served me well the rest of the trip. Then I grabbed some Thai food a half a block away and made my final hunt of the trip at Spin Cycle, which is also in the same block. Again, I was pretty fried. I initially swore to myself that I would NOT go in here. I was so tired and while I log over 1000 miles a year on a bike, I was not ready for those hills. But I felt somewhat better after my lunch so I hit it up anyways and made myself go through the motions. I eventually found the jazz section (in the 'more records down here' area) but two guys were digging and I did not want to disturb them. So I glanced at some other stuff and roamed around taking pictures and making a nuisance of myself. When they were done, I went down there....but I was done. Literally, couldn't deal with it. 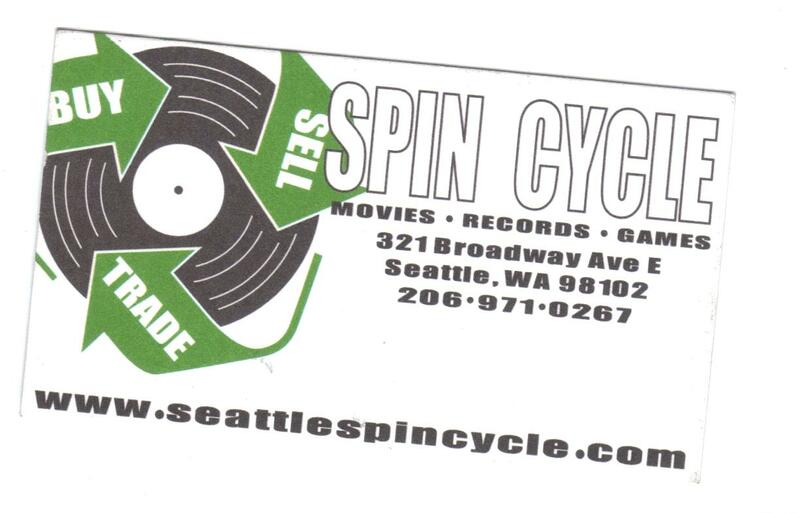 So I flipped through a couple, grabbed a business card on my way out (scanned below, as always) and got back on that bike and headed out for more foods and coffee. I had a great, great time in Seattle and maybe that was partially because it felt a lot like Chicago. Or maybe I was just in the right neighborhoods. This blog barely touches upon all the stuff I did for the days I was there. We ended up finishing the project early so I had all day Monday to go out and my flight wasn't until Tuesday. I took advantage of the time I had, as evidenced by this long post. I'd love to go back, I hope one day I do.